To some degree I agree that markets are ‘natural’, in the sense that I believe that people will, almost inevitably, do deals with one another, and try and get the best return they can for their work. (It happened even in states such as the Soviet Union which tried to abolish the market.) But politics are also ‘natural’ in this exact same sense of stuff that is bound to happen, bound to be part of the picture, as is expecting the community as a whole to help out in a crisis, collective action etc etc. Capitalism, and the notion of the ‘free market’ are, after all, very recent historical developments, and, as Frank points out, the ‘pure Capitalism’ that these people dream about has never existed, and could never exist. It is a one-dimensional concept, an essentially Utopian idea which, like all Utopian ideas, only works if you exclude reality from your worldview. Frank is interesting on the way in which this libertarian right wing mirrors, sometimes quite consciously, the left. It uses the language of injustice and class war, for instance, to pit ‘ordinary decent Americans’ (including billionaires!) against a ‘liberal’ elite, which it sometimes characterises as fascist or Nazi. And Frank sees its adherents as blinkered in much the same way as the leftists who visited Stalin’s Soviet Union in the years after the Depression, and managed to avoid noticing famine, terror and gulags, and see instead a socialist Utopia. What is terrifying in all these cases is the capacity of human beings to persuade themselves that something is its exact opposite. ‘Freedom is Slavery’, ‘War is Peace’, ‘Poverty is Plenty’, went the slogans in Orwell’s Oceania, and now we have billionaires as victims, liberals as Nazis, and poor people as the cause of the problem. Of course, as Frank points out, the misty soft-focus dream of an America consisting of decent hard-working business people (regular guys like you and me) competing in the market place, is essentially a facade (rather in the same way, I suppose, that the rhetoric and iconography of socialism was used as a facade for tyranny under Stalin). The folksy Tea Party rhetoric distances the movement from big business, depicting the latter as monopolistic, in cahoots with the state, on the scrounge for subsidies and lucrative government contracts, but it is nevertheless big business’s purposes that the Tea Party serves. We have no exact equivalent of the Tea Party in the UK, but there are plenty of people here who have taken the opportunity presented by the crisis in capitalism, to roll back the state still further, and give unfettered capitalism still more freedom to act. I strongly recommend this book. 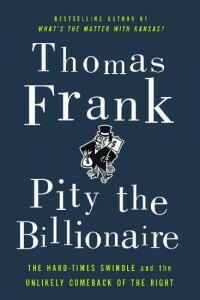 Pity the Billionaire on Amazon UK.